Do a Google search for Tu b’Shvat and you’ll read that it is a “minor holiday” on the Jewish calendar. It’s true that there are no required observances on the 15th of Shvat; no extra shul time is required and there’s little preparation or learning in advance. To mark the day we may buy some dried fruit or if we’re feeling adventurous, visit the garden center and plant a tree. However, it’s actually quite a notable holiday here in Israel. There are many ways Israelis mark the 15th of Shvat. And much to my pleasure, most have to do with creative ways to serve food. Some of my neighbors host an elaborate Tu b'Shvat seder, like this one at aish.com, complete with four cups of wine and as many as 30 varieties of fruit. Markets overflow with enticing displays of fruits and nuts weeks before the holiday. Then the recipe swapping begins as we figure out how to take advantage of our newfound attraction to exotic fruits. 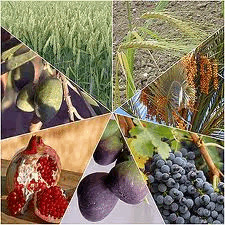 These seven items of produce are all native to Israel, yet they also grow in other places as well. What makes them exceptional is that each of the species tells us something about who we are and what we can be. For instance, Pomegranates are filled with luscious seeds representing our abundant desire for mitzvos. With wine from grapes we sanctify time, with wheat we observe the mitzvah of taking challah. In the heart of every Jew is a “pintele yid,” burning like the Menorah fueled with pure olive oil. Figs, because they continually produce throughout their growing season, show us we find sweetness in the continual review of our Torah learning throughout our lives. The life of a Jew is sweet like dates, the sweetest of fruits. All seven serve to express attributes unique to the Jewish people. There is even a special blessing we say after eating any of the Seven Species. Interestingly, the entire body of this blessing centers on our yearning for Israel, Jerusalem and the Temple. Eretz Yisrael is the only place where the qualities of both the produce of Israel and the Jewish People can be realized in their full potential. On Tu b’Shvat Jews all over the world connect to the unique attributes of the Land of Israel by eating her produce. I originally wrote this article for The Kosher Eye and I just had to share it with you! The Kosher Eye is a wonderful resource for everyone interested in learning about kosher certified items and the kosher lifestyle. Check out koshereye.com & see their latest news.